CHICAGO, IL – Since it was closed last June, the 2400-seat New Regal Theatre, designed by John Eberson in 1927, has sat vacant according to a recent report in the Daily Southtown. 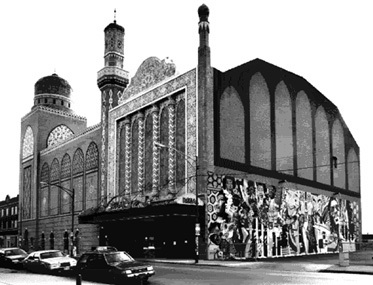 The Middle-Eastern/atmospheric-style former movie palace, which was originally known as the Avalon, was shuttered by its owners, Soft Sheen founders Edward and Betiann Gardner after the theater’s profitability declined over the years, often more often dark than not since the venue was reopened in 1987 as a South Side entertainment center after millions of dollars were spent on returning the New Regal to its original appearance. The theater closed as a movie house in the 70s, and briefly served as a church before its restoration. It is named after another famed South Side movie palace, the Regal Theatre, which was razed in 1973 after a fire severely damaged the interior. The New Regal was named a city landmark in 1992. There have been some bidders on the New Regal since it was put up for sale, including CAPA (the Chicago Association for the Performing Arts), though a CAPA spokesman will say nothing more than confirm the organization is in talks with the Gardners.